I’ve been M.I.A. online for awhile. Those of you who follow these posts may be wondering why. Blame “dem bones”—the ones in our family that keep breaking. First my mother fell and broke her hip necessitating an extended trip/stay in Ontario for me. I returned to B.C. to break my little toe on a table leg. Oh, that little piggy went wee, wee, wee! Still, it all pales in comparison to my stepson’s motorcycle misery. He landed with a broken hip, femur, kneecap, fibula and tibia! It’s almost like dem bones are trying to tell us something. Slow down? Pay attention? Take it easy? Maybe all of the above. Summer seems ideal for that—especially the sunny one we’re enjoying here in B.C.—so I’m propping my pained piggies up on pillows and chilling out. I hope you’re chilling out too (minus the ice pack)! While I’m resting dem bones, I’m brainstorming stories for another book set in fictional Big Beaver County. I’ve got one about a tattoo artist who can’t spell and I’m working on another about a fly fisherman who’s trying to snag his best catch yet. I’d love to hear YOUR ideas for what you’d like to see happen next in this crazy corner of the Pacific Northwest. Or which comic characters from Beaver Bluff you’d like to see make cameo appearances in new stories (Margery Millhausen, the love-starved librarian? Garmond Grayley, the flatulent downsizer? Or?). Cindy Shantz and I are also brainstorming new performance material for this Fall. I think I’ll sprinkle a serious story or two into our September 27 WordChickz performance at McMillan Arts Centre in Parksville. It’s all about balance … something dem bones protest I haven’t had enough of lately. So here’s to balance … in your life, and mine! P.S. 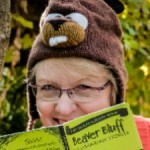 I’d love to hear (maybe even develop) your new story ideas or reprise your favourite characters from Beaver Bluff. Let’s chat—in the comments below, or privately (via the contact form). 4 Responses to Dem bones … dey break! Glad to hear you’re cookin’ up more stories Judy and planning a WordChickx (SP?) performance in the fall. Great photo of you and Cindy! 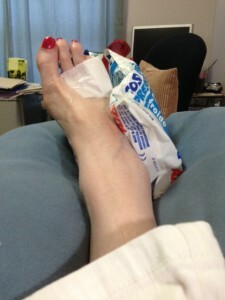 A friend of mine broke her little toe as well. (She’s in Stratford, Ont.) She says the little toe is for balance so maybe you’ll find some now as you get back to your writing. Thanks, Mary Ann. We’re happy with the photo too! Greg Samborski does good work!